Cast of a Clovis point from the Lamb site. 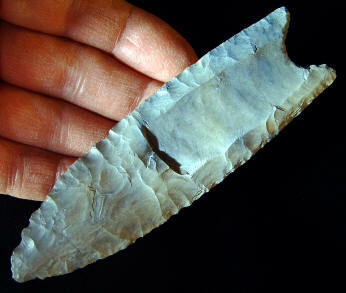 This large fluted point was discovered during the excavation of the Lamb site in Genesee County, New York. It was found broken and it was reassembled from three pieces. It is reported to be made from Ohio/Indiana chert and measures 4 3/4 inches (12.1 cm) long and 1 1/8 inches (2.9 cm) wide.